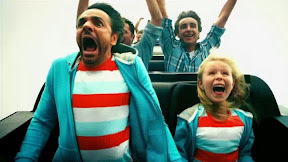 What starts as a fast-paced new spin on Three Men and a Baby adapted for Mexican audiences by popular actor Eugenio Derbez in his feature filmmaking directorial debut work (which he also produced, co-wrote and starred in) becomes something different altogether by the time the final credits roll. Although it begins with a formula, by taking the Three Men set-up but subtracting two characters to focus on Derbez’s adult coming-of-age from Acapulco based Casanova with a Peter Pan syndrome to a responsible father of a young daughter, Instructions Not Included soon deviates from its predictable nature around the film’s halfway point. And while some of the comedic bits (including a few tonally awkward, over-the-top flashbacks that open the movie) are played much too broadly to gel with the storyline, the emotional aim of this heart-tugging work never fails to ring true. It’s well worth hanging there during the film’s all-over-the-first act as your patience is rewarded with a high-quality film. For as soon as it finds its footing, you’ll begin to see why Instructions Not Included broke box office records in its native Mexico while also becoming the fifth highest grossing foreign film in the U.S. so far. While many have speculated as to the various reasons behind Derbez’s enormous success, I think it owes as much to the universality of his film’s father/daughter family-centric storyline that everyone can relate to regardless of country borders and native languages as it does to positive word-of-mouth. Namely, this little sleeper that could seemingly doubled its audiences from one week to the next despite the fact that it received a fraction of the advertising budget or U.S. press coverage that other Labor Day released big-studio-backed blockbusters were granted. Already somewhat recognizable to art-house/foreign audiences due to his moving turn in another Mexican crossover hit Under the Same Moon as well as bit parts in Hollywood features here and there, Instructions has turned him into an international star. As tender as it is bold, Derbez’s undeniably contemporary offering quickly defies Latin American machismo stereotypes by forcing his Casanova not only to grow up but also fixating on his bond with a daughter versus a son and daring to make her a sidekick instead of a mere princess. Surprised with a child after his brief fling with a beautiful American tourist named Julie (Jessica Lindsey), Derbez’s Valentin Bravo is in for the shock of his life when Julie abandons the baby with him, leaving him at a loss when she never returns from paying her cab driver. Whereas Julie needed time without the baby to get her life in order, life with the baby soon inspires Valentin to do the same, after the two venture to Los Angeles to try and track down Julie and a chance death-defying encounter with a Hollywood player finds him lucking into work as a stuntman. Predictably, of course Valentin falls head over heels for his daughter Maggie (Loreto Peralta), who quickly grows to grade school age via montage. Yet to its credit, this isn't the only plot as unpredictably the film opts for more than one genre metamorphosis in its 115 minute running time. Moving from a sitcom style start into a legal drama before segueing once more into family dramedy, Instructions Not Included is an ambitious film but more impressively an effective one that never loses you in its briskly paced journey from offbeat start to bittersweet finish. Always maintaining the same fresh, vibrant and mischievous sense of fun it utilized in its first half even when it ventures into more serious terrain, part of the reason Instructions works so well is that the core group of characters are always treated with complexity and dignity. Whereas most studio fare would’ve been tempted to make Julie a selfish one-dimensional monster, Derbez’s script, which he cowrote with Guillermo Rios and Leticia Lopez Margalli, never takes an easy way out – continuing to treat her with humanity and empathy even when she returns perhaps a bit too conveniently to reacquaint herself with the girl she left behind. While it does throw you for a loop, getting mighty serious, mighty quickly in its final act that begins to pay off on some suspicious snippets of dialogue that were sprinkled throughout the film, the screenwriters handle the turn of events masterfully, giving us enough red herrings, surprises and gentle comedy to make it much easier to bear than perhaps the Marley & Me style anguish which we feared. 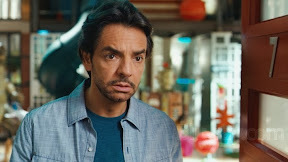 By refusing to play by the rules of any one genre and daring to make us see multiple points of view throughout the film, Derbez has given us a deeply nuanced, far richer cinematic experience than most of us were likely expecting from the way too far off the deep end broad comedy that was served up in the beginning. Balanced as well by the genuine chemistry between Derbez and the Peralta that has a Paper Moon meets The Kid vibe, this sunshine-bright, affectionately made labor-of-love is well worth investing time in on DVD or Blu-ray complete with subtitles and an Ultraviolet digital copy of the film included in lieu of child-rearing instructions.